Have you ever missed an important tweet just because you were on holiday with no roaming or you were just to busy to read new tweets? This will no longer happen. Our new product Kiwittr will help you to deal with this problem. The Kiwittr adds new event to your calendar whenever new tweet you are interested in occurs. If you have SMS notification enabled the message will be also sent to your cell phone. It is very easy to start using the Kiwittr. First of all you need to sign in using your Google Account and accept the ability to use your Google Account to sign in. Then the profile page welcomes you with its stepwise wizard. You need to authorize access to your Google Calendar so the Kiwittr will be able to add new events into it and also you need to authorize your Twitter account so the Kiwittr can run search queries using your account (the access is read only so there is guarantee we will not spam anyone using your Twitter, you can use share on Twitter button manually if you like the product). After everything goes green you can add new Twitter query. You probably wants to add some sophisticated one such as "from:manningdotd java OR groovy" not to miss any deal of the day from Manning publisher but you can as well type a single word such as "myinterest". If you are bored of retrieving notifications you can delete particular query using the "remove" link right next to the query text. And what happen when a new query is found? 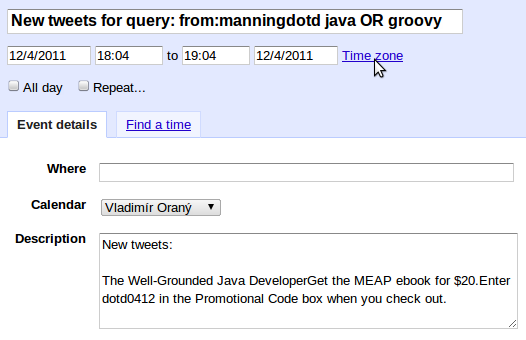 If you have SMS notification enabled in your Google Calendar you retrieve ordinal text message such as "Reminder: new tweets for query from:manningdotd java OR groovy". Now you probably hurry to the closest wifi enabled coffee house or a hotel room and read what's actually happen. You don't need to search twitter again to find what's new. The found text is recorded in the description of newly created event. The Kiwittr is currently in beta testing phase with the limited number of users. So don't wait and try it now.